Why Sun, why Swan and why on earth a Snake? Why Sun, why Swan and why on earth a Snake? And lotus and waters? Is there any significance for all these symbols? This is what every person who looks at our logo/emblem asks. This he expressed while he was in conversation with Ranada Babu, the Founder and Professor of Jubilee Art Academy, Calcutta in 1901. Read the conversation here. An interesting explanation of what Swamiji succintly put is discussed in detail that can be read by clicking below “OPEN PUBLICATION”. This is an editorial appeared in the Vedanta Kesari , a monthly English Journal of Sri Ramakrishna Math, Chennai. One of the oldest English religio-philosophic journals of India, it is devoted to spirituality and culture, and provides a feast of elevating and noble thoughts from all corners of the world. Thousands all over the world have discovered the secret of peace, joy and fulfilment through The Vedanta Kesari. It is a practical guide to successful living for the entire family and is read by an estimated 60,000 people from all over the world. Humble pranams and Greetings to Revered Swamiji. 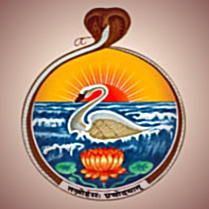 What a brilliant interpretation and insite on the part of Swami Vivekananda on creating this divine emblem. Just looking at it at the first glance brings peace and tranquillity to the mind. It shows us that without Karma, Jnana, Bhakti and Yoga it is very difficult to attain the Supreme Paramatman. Wonderful are the insights of the revered Swami Vivekananda… I had a few friends who studied a college named after the great saint. To make it appear cool they would say they studied in St. Viveks… at that time it was a great rebuttal for hindu youth who falsely prided themselves in being part of St. Josephs… what is your opinion.